Exterior sun visors for classic cars. Homepage. This page: External car sunvisors available from companies such as Weathershields, Wingard, Fulton and KL. Sun visors really came into vogue in the UK during the 1950s, and they continued to be offered throughout the 1960s, although by this time demand was on the wane. In sunny climates, such as those found in Australia and parts of the US, external sun visors were very useful gadgets to fit on your car or truck to cut down on dazzle while driving. Here though they were more often fitted as a stylish accessory, rather than an essential, or useful, addition. The increase in drag that they must have created, and the damage it'd have done to many cars' performance and economy, rarely seems to have factored in the buying decision. There were a number of suppliers for exterior sunvisors, each slightly different in design but basically doing the same job. Many were fitted to the British cars of the late 1950s that incorporated a hint of "rock and roll" in their design, where chrome plating and bright, often two-tone, colour schemes were all the rage. Cars such as the Vauxhall PA Cresta, the F-Type Victor, and the Ford Consul and Zephyr Mk2 would often be adorned with a colour-matched visor, adding to the jukebox/Americana look. Shown below are just four of the types available to motorists in the late 1950s and early 1960s, all found in a trade catalogue from that era. (a) The Kelvin Exterior Visor. The first in this selection was known as the Kelvin Exterior Visor, an all-metal affair supplied in primer to the trade for them to paint to match their customer's car. Many cars of the 1950s are listed, with prices for popular Austins (such as the A30/A35, A40 Devon and Somerset, A55 van and the A70 Hereford) coming in at 4 5s 0d. Visors for Morris Minors, Standards (8, 10, Companion, and Vanguards) were similarly-priced. Those for classic Hillmans (eg Minx, Husky and Cob) were a little cheaper at 4 0s 0d, while cads in their V8 Ford Pilots would have to shell out 4 10s 0d (excluding painting and garage labour charges) to equip their cars. Owners of Fiat 1100s would have to pay the same figure, although quite how many visors for that range sold in the UK we'll never know - there can't have been many. Next is the Weathershields external sun visor, again in steel and supplied with a primer finish only. Unlike the Kelvin visor, the Weathershields visor lists the most popular Fords of the day in their price list - namely the Anglia, Prefect, Consul, Zephyr and Zodiac (3 17s 0d to you Sir/Madam). Raffish types with a Jaguar, whether it be a Mk VII, 2.4 Litre or XK140 could also be accommodated (4 15s 0d), while the garage mechanic working on his bank manager's Rover P4 would also be looking at paying 4 15s 0d for a suitable visor. The Wingard was available for many many cars, including the aforementioned Fords, Hillmans and Austins. Vauxhall fans could breath a sigh of relief as visors suitable for the Wyvern, Cresta, Velox, and Victor were listed, as was one for the Volkswagen (costing 4 19s 0d). Apparently the Wingard visors were "non-rusting, light and rattle-proof". K.L. produced many different car accessories at this time, including car seat covers, ash trays and aftermarket car heaters. 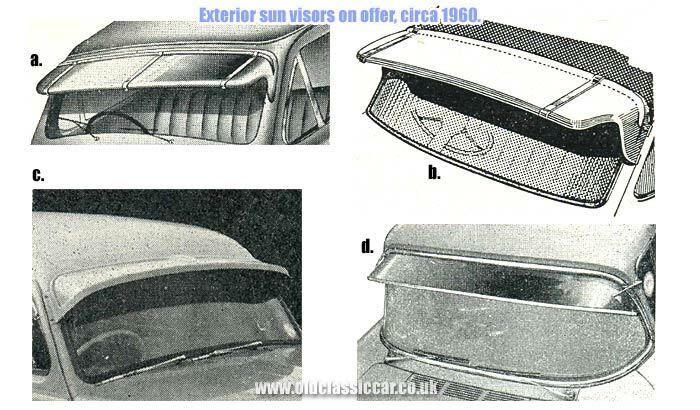 Their sun visor is being modelled by an F-Type Victor in this illustration. Prices for the KL visors were higher than those of the competition, but they did feature one neat extra in that they incorporated a car aerial within their design - perfect if you didn't want to drill your car's roof or wings to install a wireless antenna. The visor fitted flush to the windscreen, with chrome plated brackets attaching it to the roof gutters. Whereas rival offerings were, typically, made from steel, the KL offering featured a polished aluminium frame, inset with a Green, Smoke or Blue perspex panel. 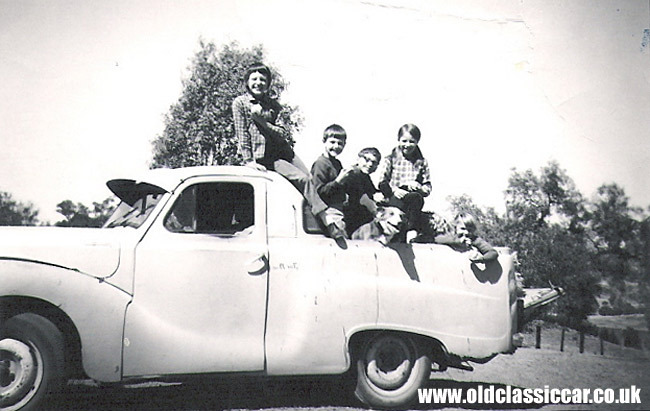 Owners of, for example, an upright Ford sidevalve (Anglia, Prefect or Pop) would need to lay out 6 10s 0d before installation, while drivers of the boxy Ford 100E/300E would need to pay 7 7s 0d. Adjustable versions of the KL visor could also be purchased, enabling them to be fitted to a wide variety of other cars. Again the popular makes and models of the day are mentioned, as are more obscure vehicles such as the Daimler Conquest and Century, Peugeot 403, Renault Dauphine, Riley 2.5, various Wolseleys (4/50, 6/80, 4/44 etc) and a selection of Armstrong Siddeleys (234, 236 and 346). Even the TR3 is listed, although quite how an external visor would look on an open-topped car I don't know. Shown below is an Australian-bodied Austin A40 Utility, sporting an external sun visor similar to those mentioned above. Fulton sunvisors of the 1940s/1950s. While visors from the likes of KL, Weathershield and Wingard were popular choices for drivers in Britain, in the USA it was products of the Fulton Company, of Wilwaukee, that many motorists turned to. In many states in the US, regular daytime sunshine could be a real issue, hence the proliferation of sunshields that were on sale in the days before air conditioning. The advert shown below was found in a trade magazine from 1949. 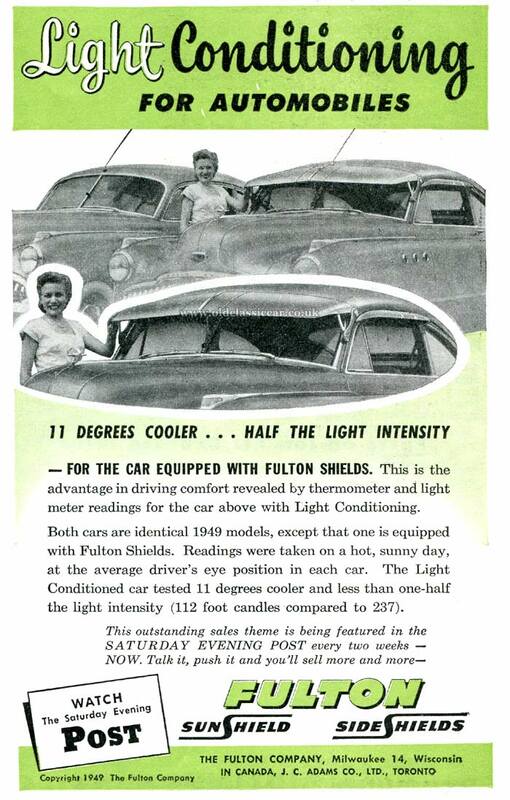 Understated as always, Fulton advertised their Sunshields and Sideshields as "Light conditioning for Automobiles", citing reduced interior temperatures and significantly less light intensity, as key benefits. As in the 1940s and 1950s, owners of cars from that era continue to hunt out these period accessories for their cars. While fibreglass copies of the Fulton sunvisors are available, for many only the "real deal" original metal items are the parts to have. Versions for both one-piece, and split "V" windscreens, were available. While the Fulton company survives to this day, they no longer produce these desirable accessories. The car used for the before/after temperature and light readings, was a new 1949 Buick Eight Sedanette, to which a Sun Shied was fitted. As I turn up more information and adverts relating to car sun visors, I'll add it in here.